On 7 December 2018 the Red Sea Governorate banned diving around the Brother Islands whilst a committee studied shark behaviour at the location. The intention was that diving would recommence in early January 2019. It is thought that the oceanic whitetip's behaviour had changed because of several factors. These include deliberate and accidental feeding of the sharks, illegal fishing activity in the surrounding area, increased diver pressure, and a lack of awareness as to how to safely interact with the sharks. Three and half months on, the Brother Islands re-opened for diving on 16 March 2019 with a new set of rules and mandatory training in place. The Chamber of Diving and Watersports (CDWS) utilised the downtime, and a mandatory shark awareness course was put in place for all dive guides and liveaboard operators. Approximately 1,500 personnel were trained by biologist Elke Bojanowski, a blue o Two dive guide and founder of the Red Sea Sharks project. The permission to dive now comes with a set of rules which were issued on 15 March 2019 by the CDWS. These must be followed by the liveaboard operators and penalties will be imposed on operators that fail to abide by the decree. It does make sense to limit the number of boats at the site, however these rules also seem to be environmentally and financially prohibitive because it is no longer possible to moor up overnight at the Brothers. The daily maximum capacity of boats on the brother Islands are 18. 12 boats for the Big Brother and 6 for the Small Brother and only during the timing mentioned in the above item. 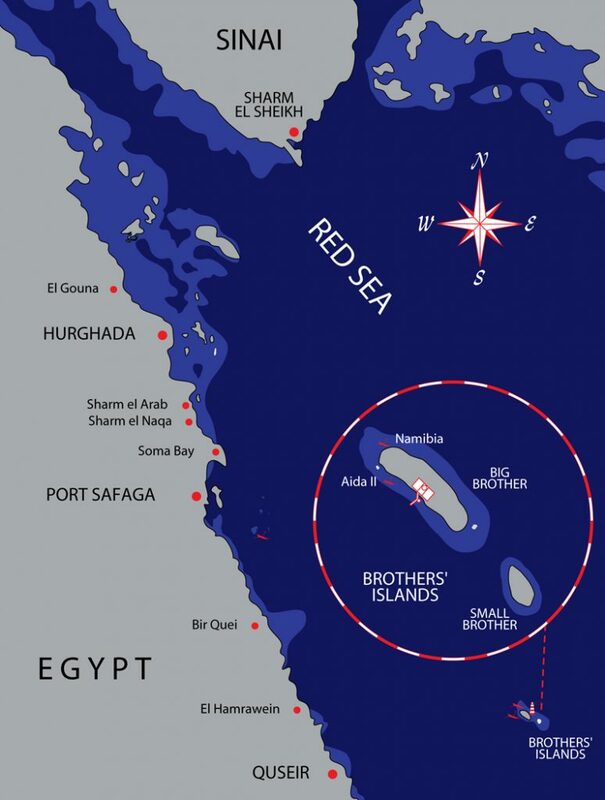 For safari boats to apply for sailing permit to visit Brother Islands, first they have to get a coordination record with CDWS 'via this link' to be able to present it to the coast guard office of Red Sea governorate. It is totally forbidden to dump any organic waste in the area of Brother Islands. It should be dumped in open water by a sufficient distance for at least 5 nautical miles.